Everything about IT: Documen Spy 1.1 brings bug fixes and a new edit field feature. Documen Spy 1.1 brings bug fixes and a new edit field feature. November and December were very busy month for me, so i was pretty quiet on my blog. I hope this will change again in the new year. 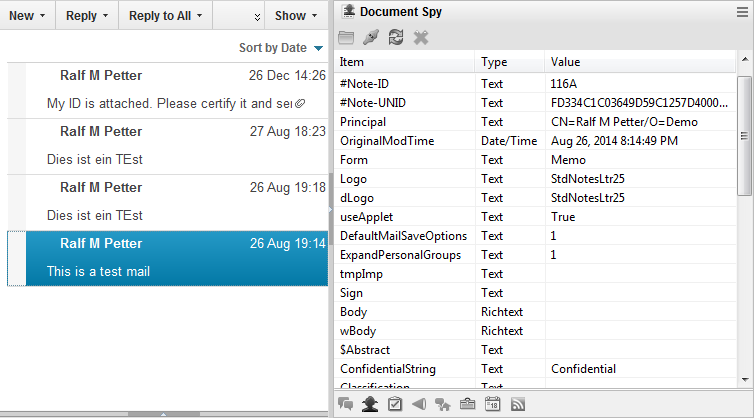 But as a late time Christmas present, i have uploaded the new 1.1 Version of my most popular free tool "Document Spy" for IBM Notes. If you do not know the "Document Spy" you can read all the details about the functionality this plugin adds to your 8.5.x and 9.0.x Notes Standard client in my blog post "Document Spy Admins little helper". The 1.1 version contains some bug fixes, especially a fix for a bug Jesper Kiaer has reported, that Document Spy can crash, when you select more then one document at a time. The fix is that only one document of the whole selection will be loaded in Document Spy at one time. I hope this will solve the problem of Jesper. But the 1.1 version does not only bring bug fixes it also contain the most requested feature in the feedback i have got for Version 1.0. It is a function to make quick changes to fields in the Document Spy. I allows you to change Text, Date and Number single and multiple value fields. Select the e-mail you want to change and the Document Spy will show all items of the selected message in the sidebar view. Scroll to the row with the "Delivered Date" item and Double click it. You will get a simple Dialog with the value and you can change the value to what ever you want. But be careful, because there are only basic checks whether your new value will be a valid one. 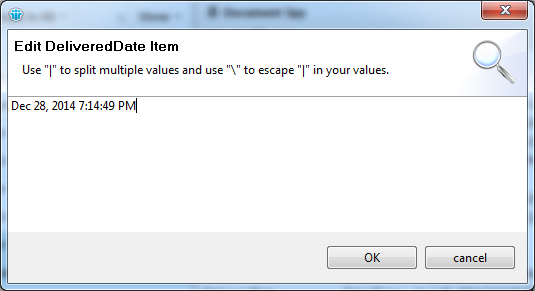 Press Ok and the new value will be saved to the document and the Document Spy view will be refreshed. If the document is open in the UI you have to reload it to see the changes. Be aware that you will produce save conflicts if you make changes in Document Spy and the UI of Notes at the same time. If you want to change a multiple value field, the values have to be separated with a "|". You can escape "|" with a leading backslash. See the $mailer field for an example. 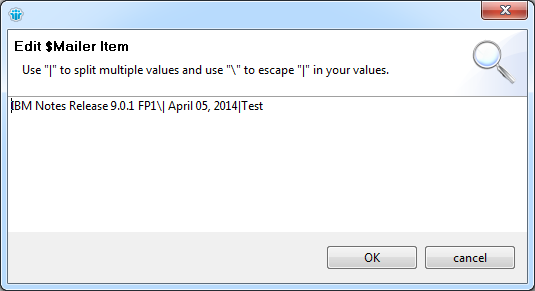 This item have 2 separated values "IBM Notes Release 9.0.1 FP1| April 05, 2014" and "Test" The "|" in the first value is escaped by the backslash. This new feature will save you a lot of work that you would otherwise spend on creating temporary agents. To install the Document spy follow the installation instructions on the Download page of the widget. What function do you use to track the currently selected document? Could be the view, the current document in a tab. Your class must implement the ISelectionListener interface. That's all.